Engineers: “Veldrums and Partners” Ltd.
Builders: “Hanza Film Service” Ltd. 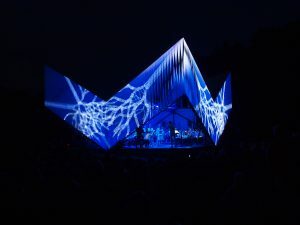 The Pavilion / stage for “Nature Concert Hall” is designed as an art object that unifies all main atmosphere making components of the event — space, light, video and music. Under the roof of the pavilion is a place for academic symphonic chamber orchestra of 20 people and Nature Concert Hall music band. 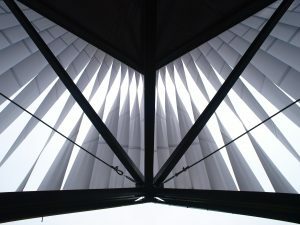 The elevations of the pavilion serves as a screen for video and light projections. Architectural volumes are referring to existing elements in the nature. 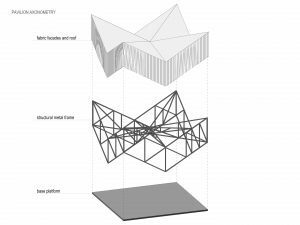 The structure of the pavilion is made in a way to reduce the amount of points touching the protected biotope meadow. Nature Concert Hall is a multimedia nature and educational structure that incorporates science, dramaturgy, music and art. Its aim is to bring attention to surrounding nature, to tell people about daily unnoticed and invite people to be careful. 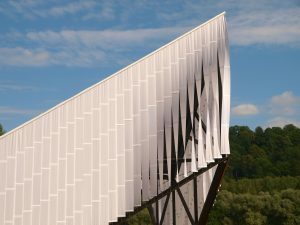 Nature Concert Hall 2014 took place in Gauja National park, near Sigulda, Latvia and its main character was armored fish — Asterolepis Ornate.